During the past season a very large number of Ariel Cycles have been supplied fitted with variable gear hubs, and now that this fitment is made perfectly reliable in every way it is being universally adopted as a portion of the standard equipment of a bicycle. This hub as illustrated has been fitted as our standard Two-speed Hub for the past three years, and has given every satisfaction, proving by experience that there is not a better two-speed gear on the market. 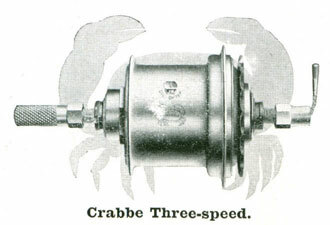 We have every confidence in recommending to our customers the Crabbe Three-speed Hub, which during the past season has proved itself one of the best hubs on the market. 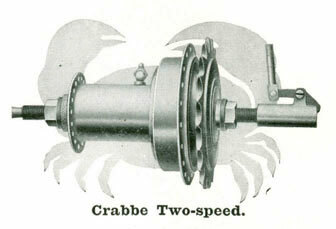 On this gear the direct drive is through the Crabbe Three-speed normal gear, the increase from this to the high gear being 27%, and the reduction to the low gear being 21%. The range of gears covered is from low 41, normal 52, high 66, to low 72, normal 91, high 115, with 26in. wheels ; and low 45, normal 56, high 71, to low 77, normal 98, high 124, with 28in. wheels. It is perfectly reliable in every way, neat in appearance, very light, compact and fast, being used by a number of the best racing men of the year, including R. Shirley, who had one of these hubs fitted to his Ariel Cycle, on which he secured the London to Bath and back record. This hub contains an internal brake in addition to the two-speed gear. It is extremely simple, but at the same time positive in action, being operated direct by the hub chain wheel and not having any connection with the speed gear mechanism. 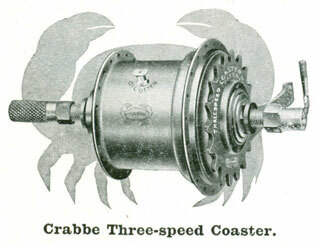 CRABBE THREE- SPEED COASTER HUB. First in 1905, Foremost ever since. 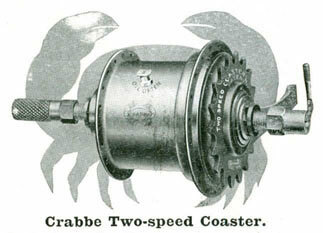 The gears of this hub are the same as in the Crabbe Three-speed, with a coaster brake in addition, similar to that contained in the Crabbe Two-speed Coaster. The extreme simplicity of the braking mechanism can be seen at a glance by the small illustration, on the brakes page.